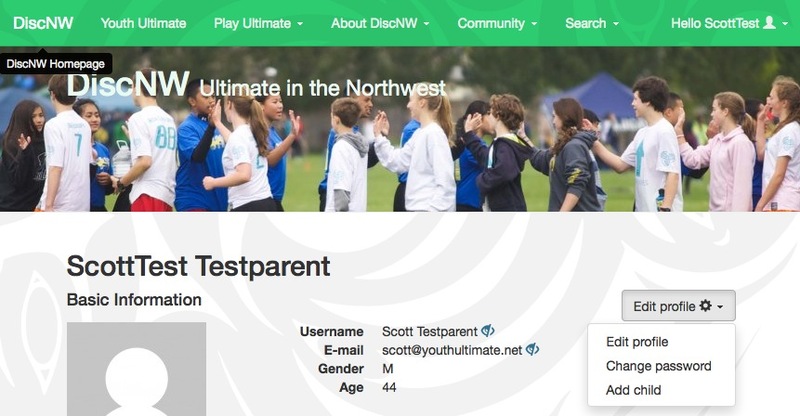 Last week the lead post on the home page of DiscNW was the announcement that the current Executive Director, William Bartram (aka “Bunny”) will leave the organization and the search is on for a new leader. The announcement (text appended) included a job description (archived PDF) which referenced the 2016 strategic plan (text also appended). 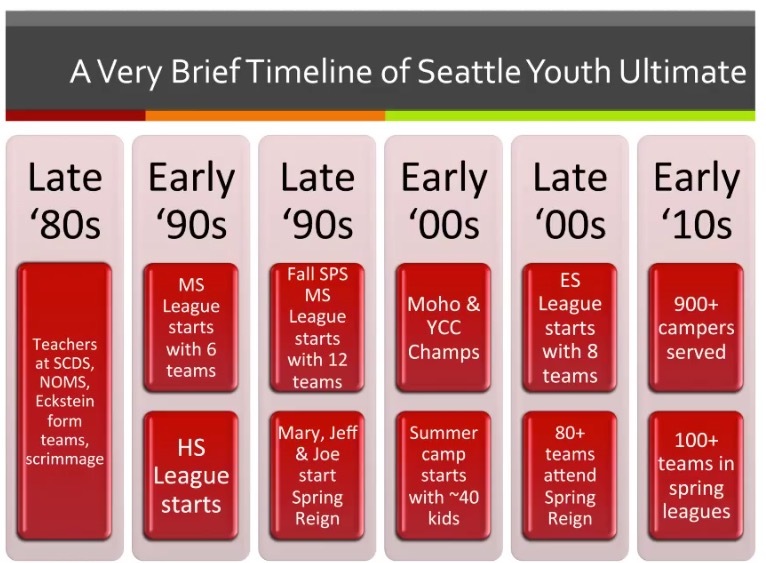 What does this mean for youth ultimate in the greater Seattle area and the Northwest region? I offer a few inferences from materials posted on the DiscNW web site, as well as some historical perspective gleaned from the organization’s annual financial reports (Form 990s for DiscNW, 2002-2014). Reading through the announcement, job description, and overview of the strategic plan, there’s not a crystal-clear vision for youth ultimate. After all, youth programming is only about 1/3 of DiscNW’s annual efforts. 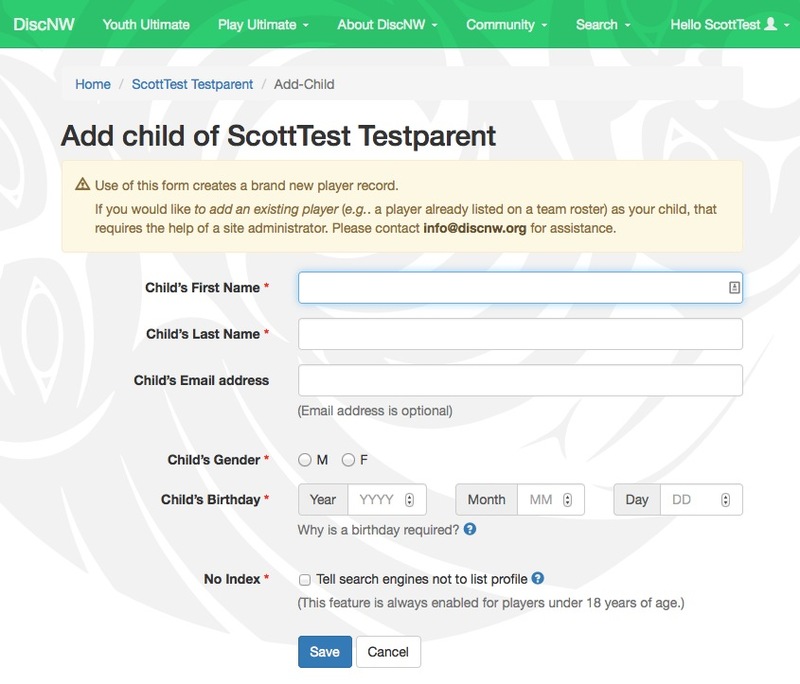 The documents, however, do contain a few hints about where DiscNW may take youth ultimate in the next few years. The announcement rightly applauds Bunny for increasing “youth participation from about 1000 to 4000” players per year, and for establishing the “Youth Development Fund now in excess of $130,000 annually.” The job announcement seeks candidates who will “direct industry standard youth programming” and “ensure gender equity and accessibility.” I’m not sure if “industry standard” means that the board considers the awesome programs that Bunny has grown to define the industry standard, or if DiscNW intends to emulate some other regional or National programs (e.g. the Canadian LTAD model). 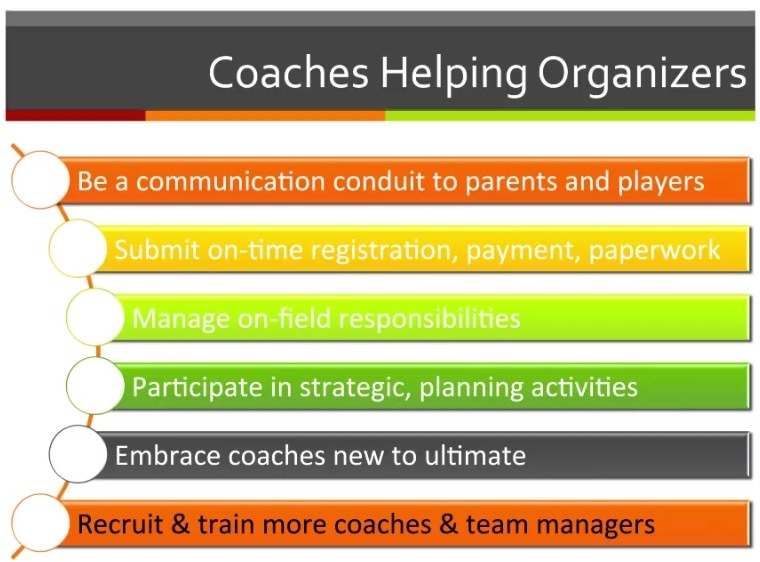 It could also be an allusion to the LTAD benchmarks and re-vamped coach development program (CDP) that USA Ultimate has been working on for the last year or two, or to the roll-out of State chapters by the National governing body which began last year… The call for gender equity in both the job description and the strategic plan, combined with the emphasis on promoting gender equity in the recent DiscNW coaching clinics, suggests that the organization may be seeking leadership that could incorporate new structure (e.g. the GUM middle school girls curriculum) into the DiscNW youth programs and coach development. It’s exciting to consider who will lead DiscNW for the next era, especially when you look back through Bunny’s long run (from ~2004-2017), the evolution of the administration, and even into the early leadership. Here’s a Google spreadsheet that characterizes the history of DiscNW with an emphasis on the organization’s “youth activities.” It’s clear from the associated graphs (below) that DiscNW has grown consistently over the last 15 years, both in total revenues and in its expenditures on “youth activities” (which according to the IRS documents includes youth leagues, tournaments, camps, clinics, and total youth players served). Youth expenditures were less than 10% of revenues when they were first reported separately in the 2004 Form 990, but in the next few years they rose to ~30%. They have remained near 1/3 of total revenues since then, though there was an interesting (yet to be explained) dip in 2012. Administrative costs (also as a % of total revenue) have also risen. In 2002 when Mike Keran was the E.D., administrative costs (compensation) were about 10% of total revenue. The percentage stayed pretty constant until ~2008, about the time the organization’s staff started to grow. In 2004-2006, the E.D. changed from Mike to Bunny, with Morgan Ahouse serving as an interim E.D. as first Wilma Comenat and then William Bertrand (Bunny) were hired and trained, with paid assistance from Mike for Wilma. Then in 2007, Bunny brought on Frank Nam as the first Youth Director. The next year Wynne Scherf was hired and paid along with Frank (who presumably brought her up to speed). About the same time (2008), Jeff Dairiki began being paid to help maintain the web site which he’s continued to do since, with some help from Mike in 2010-11 and a concerted paid effort (to rebuild the site?) in 2013. Finally, in 2011, Elizabeth Brown was paid as an Operations Manager, a position which switched to Rusty Brown the next year. The growth in adminstrative staff has brought total compensation to about 20% of total revenue. This seems quite reasonable (for an organization that doesn’t maintain a central office and has staff living in Seattle where expenses are high) but it would be interesting to compare to other comparable regional entitities, to the extent that the exist. Perhaps the Bay Area Disc Association (founded 2008) or Minnesota Youth Ultimate (founded 2003)? Know of any other organizations that might be comparable? Leave them in the comments! Our Executive Director (ED), William Bartram, has recently informed us that he will be leaving our organization. The board thanks Bunny for his work, love of the sport, and commitment to our community. We are lucky to have a resilient organization with dedicated staff members, who will continue to provide excellent programs to the community as we begin recruitment for a new ED. The job description is now available and the position is open for applications — please spread the word if you know of a motivated, sport-loving, non-profit leader. Bunny will continue in his position in the interim, and will work with the new ED to transition his responsibilities by early summer. For questions about the position, contact jobs@discnw.org. DiscNW will be posting occasional updates on our social media channels about our recruitment process. If you see Bunny on the fields this spring, please thank him for his years of service to our community! In 2016 DiscNW developed a new strategic plan to guide the organization through the next three years. Through this new plan, DiscNW will strive to strengthen our ultimate community. The plan will allow the organization to be more nimble, and it will empower staff to take action. DiscNW will serve as a regional resource by being a model organization and reaffirming our commitment to the Spirit of the Game. Notes from the mandatory pre-season meeting run by Jude Larene, Youth Coordinator for Disc Northwest, on Wednesday, March 2, 2016 from 6-7:30. Impressively the number of teams has increased by ~20% this year (including 5 new teams within Seattle) — the fastest growth of all the youth spring leagues run by DiscNW. The meeting was attended by ~40 coaches, as well as Jude and the DiscNW Account Manager, Kate Speck. A highlight was receiving 5 free J-star 140-gram discs with an entrancing rainbow print of the DiscNW logo! 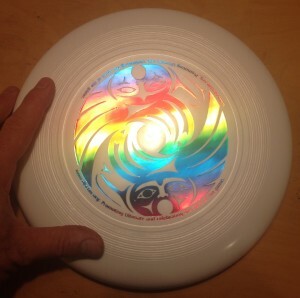 140-g J-star youth ultimate disc with RAINBOW DiscNW logo! You can buy more for $7/each! In 5v5 teams, offense chooses 3:2. Set the coaching bar very high! Score of 2 or 1 will require a comment this year; please provide a detailed explanation; Jude will contact the other team and help educate. Games to 11; 75 minutes; hard cap at 60 minutes. Only one field marshall hired for whole league! Send responsible high school seniors to Jude to be additional marshalls! Advice if you are still placing kids (e.g. by skill) onto teams: put them all on one roster so they can sign waivers, then re-organize later. Paper waivers can be scanned and emailed, or snail mailed; be sure to use current version of waiver! Are there AEDs available at major fields like Magnuson? John Leahy: is going to 5v5 a sacrifice or not? What about playing on other days of week, e.g. after school? Do playoffs make sense for elementary school? Could fields along I-5 corridor expand capacity (e.g. Shoreline)?